You can always count on the Italians to deliver the goods when it comes to power metal. Regardless if you prefer the bombastic and symphonic variety (Rhapsody of Fire, Ancient Bards), the more traditional, slightly progressive kind (Labyrinth, Vision Divine) or the balls to the wall straight up power metal bands (Derdian, Kaledon), there’s something for everyone. Standing firmly in the melodic power metal camp, these guys deliver their third album They Never Say Die, following on 2016’s The Curse of the Avenger and 2017’s Ticking Clock. They Never Say Die is a concept album, or a tribute if you will, to classic 80’s cult movie The Goonies. It’s apparent from the get go that the band are huge fans. You don’t need to have seen the movie to enjoy the album, but it certainly helps you get all the references. Musically though, as stated, we’re in firm European melodic power metal territory. Basically every chorus is catchy as hell and made to sing along with. There’s a mix of faster and (slightly) slower tracks on the album, and it feels very balanced in that way. After a short and somewhat menacing spoken intro the band kicks into high speed antics with the opening track ”Hell-O”. Following on that song we have the slower, more mid-tempo rocker ”Hoist Our Colors”. It’s somewhat darker, which makes it an excellent counterpoint to the happy opening tune. Then comes the glorious, the joyous ”The Truffle Shuffle Army: Bizardly Bizarre” which, apart from getting the song title of the year award also delivers one of the most anthemic, happy and catchy choruses I’ve heard in a long time. Not only is this song a power metal masterpiece; it also features a guest appearance by Alessandro Conti (Trick or Treat, Twilight Force). What more could you ask for? After ballad ”To Leave A Land” we have another glorious tune, namely the title track. The band shot a video for this one, and it was a great song to select for that endeavor. The chorus is yet again catchy as hell, and towards the end of the song the vocal lines turn really anthemic. I wish they’d extended that section of the song further, but as it stands, it’s still a cracker. Conti isn’t the only vocalist guesting on the album. On mid-pace rocker ”Last Chance” you get to hear Michele Luppi flex his vocal chords, which he does very well. Morby from Domine sings on ”I Have The Key”, another high-speed scorcher that ups the ante even more when it comes to happy refrains. I realize I haven’t even mentioned the band’s charismatic frontman Tomi Fooler. My mistake. The falsettos he’s capable of are unreal, some of which he delivers on the aforementioned track. The album features more guest vocals. Rounding off the record are two cover songs, one being Avantasia’s ”Farewell”, a duet with Melissa Bonny and a take on Cyndi Lauper’s ”Goonies R Good Enough” with Giacomo Voli (Rhapsody of Fire). All in all, this is a no-brainer for fans of (European) melodic power metal, and a high contender for inclusion in later year’s best lists. 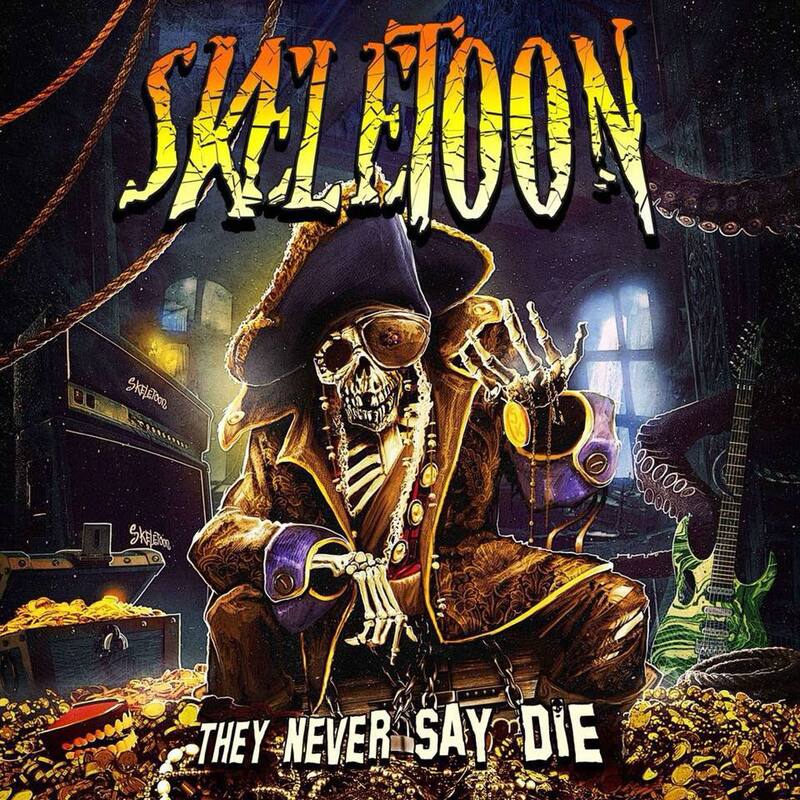 You probably won’t find bands as eager to cheer you up and put a smile on your face as Skeletoon. Highly recommended.